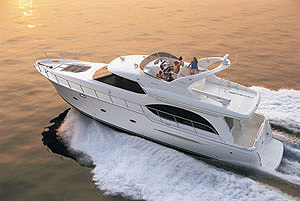 2003-launched example of this stunning Italian 53ft 3-cabin, 3-heads open sports cruiser. Professionally maintained from the Captain with fantastic specification including air-conditioning and powerful 680hp MAN engines. The Rizzardi CR 50 Top Line is a motor yacht with an iconic Italian yacht manufacturer with over 40yrs of family ownership under their belts. The CR-50 is a sporty, powerful, yet luxurious yacht offering three accommodation cabins plus three heads within her spacious interior. 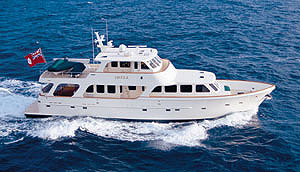 Externally, she boasts two large sun decks one accessible from the aft platform step ladder and the other bow, huge, free and clean classic American yacht style, accessible from the side decks. The cockpit features a sofa-arrangement equipped with table allowing guests to remain outside in comfort and safety during navigation. 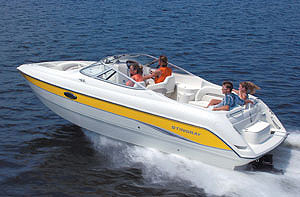 Powered by ultra-reliable 680hp MAN 8-cylinder diesel engines, the Rizzardi CR-50 Top Line cruises effortlessly at 28-30 knots and will go on to up to 36 knots if needed. The history of Rizzardi Yachts stretches back over 40 years as a family business which today is famous all around the world. A love of the sea, an obsession with research and perfection and attention to the latest trends and innovate styling have allowed the Rizzardi family to launch over 500 boats. Rizzardi Yachts are never mass-produced, with their designs open to customisation for their owners in terms of layouts, materials and finishes. It is very unlikely to see two Rizzardi Yachts exactly the same. The yacht are designed and built in-house at the Rizzardi Shipyard in Sabaudia on the Mediterranean coast between Rome and Naples. 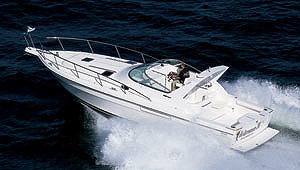 Rizzardi Yachts are 100% Italian. 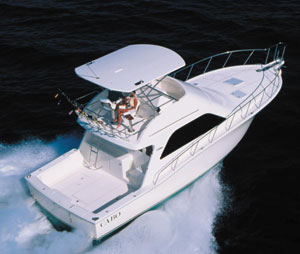 The current-day Rizzardi Yachts line includes a range of open planing yachts between 48ft & 57ft and flybridge motor yachts between 77ft & 122ft. Master cabin forward with centre-line double berth, hanging lockers and ensuite heads with shower. Saloon aft to port with L-shaped seating. Day heads aft to port. Twin cabin opposite to starboard. Crew/occasional guest accommodation at stern with two single bunks, hanging locker and heads with shower.